When all the plumbing was finished and tested, the walls of the toilets of 27389 were filled and sanded. After an undercoat was applied to the walls, further filling and sanding was shown to be necessary, so this was implemented. At this time, the re-painted ceiling panels were put back up. 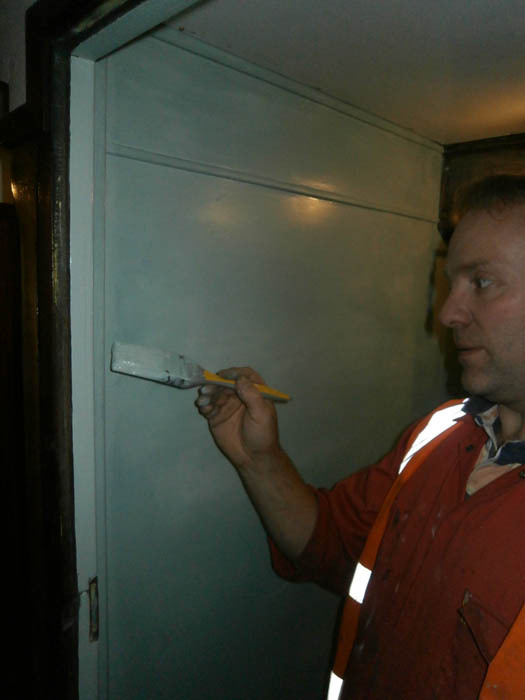 After undercoating the walls of the toilets, they were painted in Duck Egg Blue. At the same time the window sills, surround mouldings and wood forming the "wash hand basin cabinet" were cleaned up and varnished. LED lighting was fitted to 27407 currently resident in the shelter, but conveniently placed near the north RCB door so that work could be undertaken. After fitting LEDs to all the lamp sockets, Don made up and fitted a 24V DC power supply into the north side battery box. A relatively small unit, but adequate to power the entire carriage LED load. 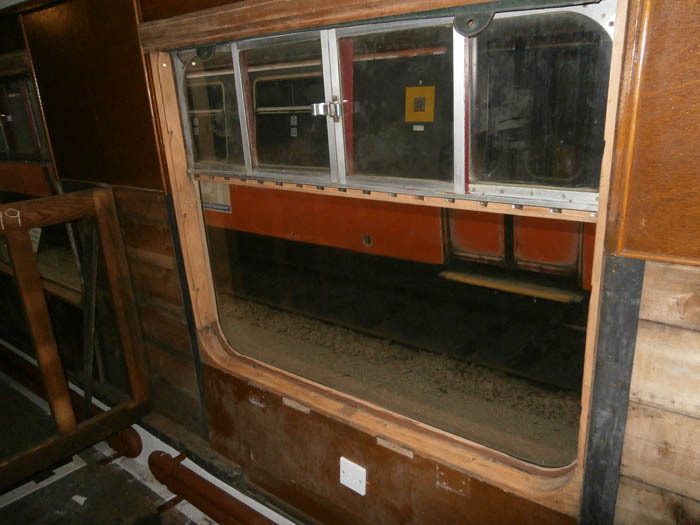 Once the carriage was lit, work on the interior was possible, and Jim Pairman was paramount in re-fitting the window sills, blinds and side pieces (cleaned and sanded by Don). Unfortunately, one of the main windows must have been in contact with something sharp (from within the bodywork) as it cracked when Jim was tapping its sill into position. Ken Ballantine, Joe (our youth at the time) and Don cleaned up the steam and electrical heater grilles for 27389. There are 14 steam and 28 electrical grilles per carriage. All had to be sanded and wire brushed before being painted in red oxide primer, grey undercoat and finally brown gloss before being screwed down to the floor of the carriage. The same exercise will be required for 27407. Much discussion ensued about the fixing method for the steam heating grilles. Eventually we realised they were held on to the carriage wall by "keyhole" style brackets and to the floor by "T" shaped pegs which were screwed to the floor. 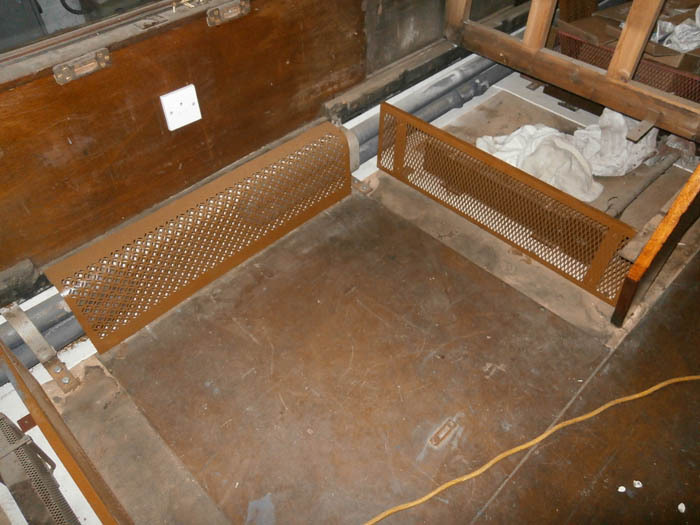 However, the floor pegs were removed during the asbestos removal operations and could not be found, so the decision was made to manufacture replacements out of brass rod and strip. The seat ends which form either side of the central aisle were cleaned up and re-varnished. The seat ends are made from veneered plywood, so sanding had to be done carefully. Several of the ends were badly scored and marked so sanding was necessary to try to remove the defects. The same scenario applied to the saloon sliding doors, the short corridor between the toilets and the vestibules. All the tables from the 2 carriages need to be re-covered as the original cloth was filthy, dried out, torn and unstuck. A real mess. 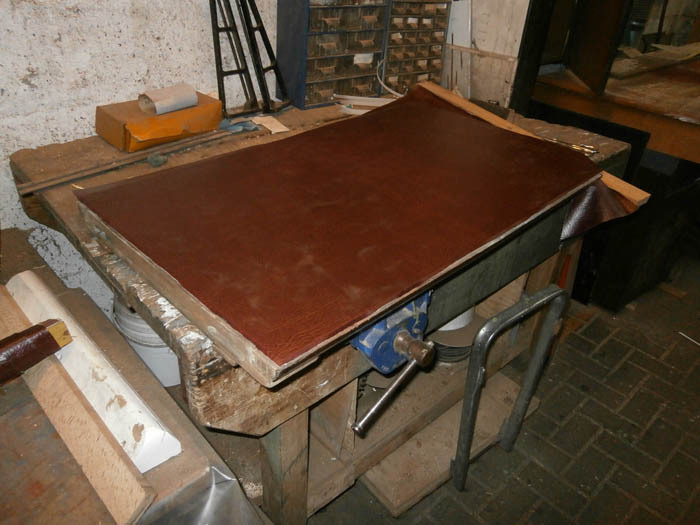 Samples of leatherette cloth were obtained, then the most suitable one was used to cover one table to "prove" the efficacy of this approach. New mouldings were required to edge the cloth on the tables as the originals were worn down and generally unserviceable. 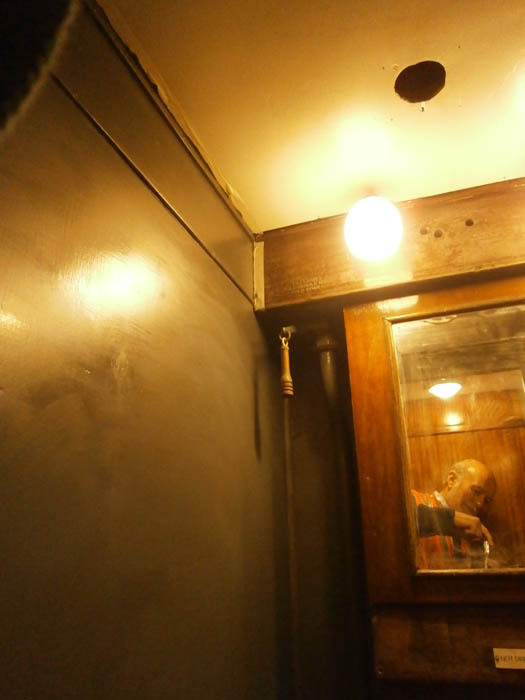 The south side toilet had a black painted window fitted. No-one knows why. A translucent frosted replacement was sourced and fitted. After completion of the north side toilet, Robbie continued with the south side (now the new window was fitted). The walls were sanded prior to painting, and he and Don repaired the interior woodwork (to be varnished) for round the new window.